Notes: Monastery of St. Jacob Saviour is an Eastern Orthodox monastery situated to the left from the Rostov kremlin on the Rostov's outskirts. 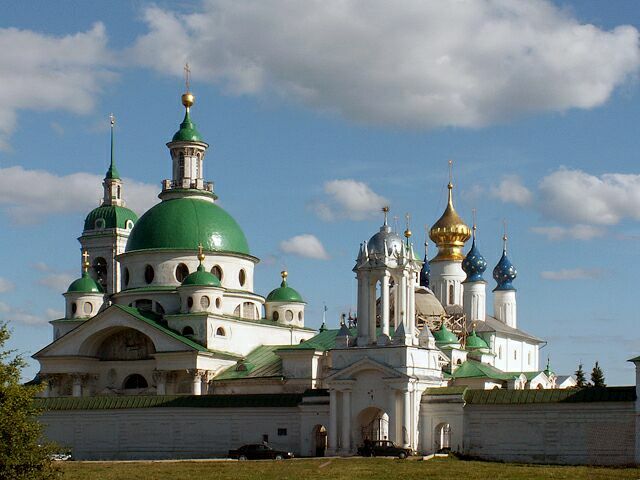 Monastery was founded in the 14th century by St Iakov of Rostov. The earliest kept building of a monastery is Cathedral of Conception of St Anna (Zachatievsky Cathedral). It has been constructed in 1686. Another 17th-century building is Savior Transfiguration Cathedral (Spaso-Preobrazhensky Cathedral) which once belonged to the abolished Spaso-Pesotsky Monastery. It has been greatly venerated as the shrine of St Dmitry of Rostov. Most of the monastery structures were built in the late 18th and early 19th centuries in the fine neoclassical style. The Cathedral of St Dmitry of Rostov has been constructed in 1794-1802 with support of Nikolai Sheremetev's column.